Dry or watery eyes can be the result of similar issues, but when the eye blinks a tear is meant to wash a tear and an oil over the eye for moisture to protect the eye, particularly the cornea. While a cracked cornea can heal if tear duct does not work properly, depending how damaged the cornea is, number of cracks or depth of cracks, cracked cornea can permanently damage vision in the eye, resulting in corneal blindness. 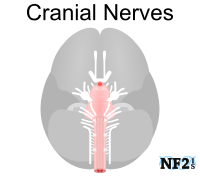 If an individual is experiencing early symptoms or complete loss of function of the 1) Facial Nerve (Cranial Nerve 7), or 2) the Trigeminal Nerve (Cranial Nerve 5) condition called Trigeminal Neuralgia, the eye may either produce too much fluid or none. 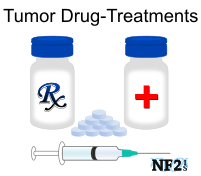 However; 3) Medications including Chemotherapy Molecular Target Tumor Treatments, can also result in dry eyes. 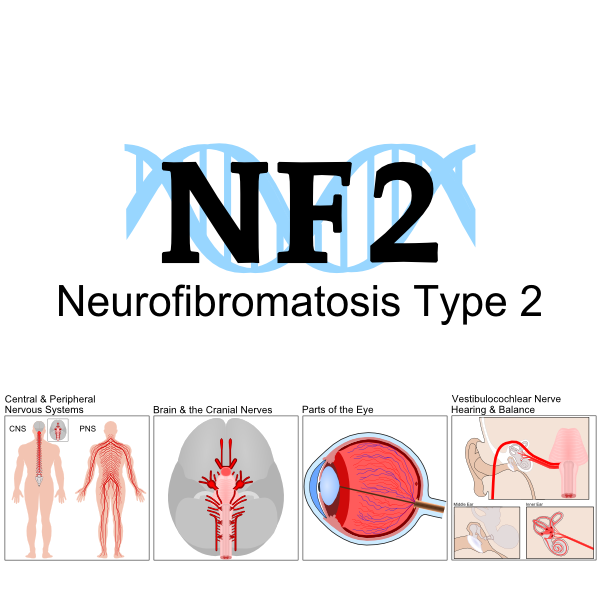 Dry eyes can be the result of the start of Cranial Nerve 7 (CN7) Facial Nerve damage and eye drops might be needed regularly, the preservatives found in bottled eye drops are often irritating when used in excess and individual eye drop options are helpful. 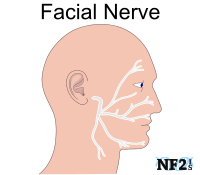 However, if the Facial Nerve is completely broken, eye drops will not stay in the eye long and quickly drip out of the eye, making it necessary to use a heavier ointment or gel. The heavier the gel is the longer it will keep the eye moist, but can cause blurriness. It is important for each individual to try different options to determine what works best for them. 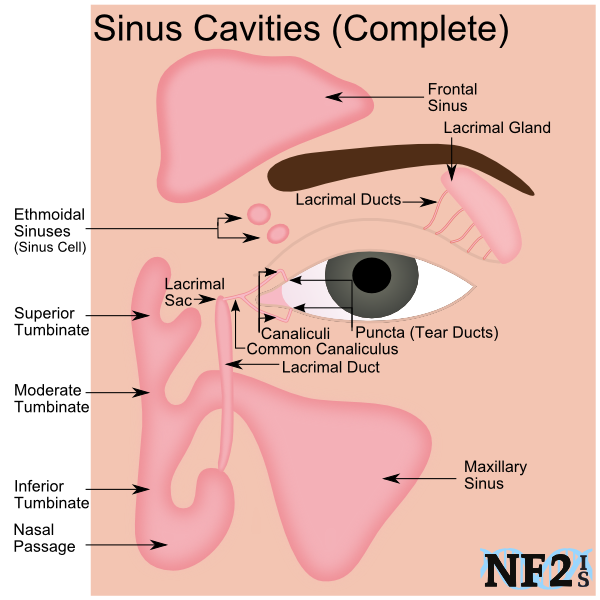 Dry eyes can also be the result of CN5 the Trigeminal Nerve. 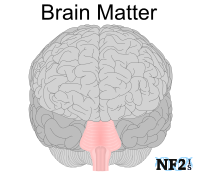 CN7 is primarily responsible for face movement, but CN5 is primarily responsible for the ability to feel the face but also includes a part of the face that helps with eye moisture. 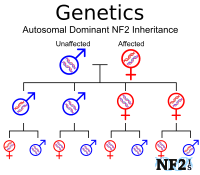 This can be even more dangerous than Facial Nerve dry eyes because an individual with dry eyes would not feel the irritation to know when or if drops or gel is needed. 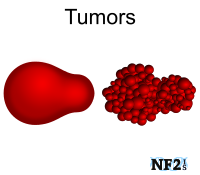 Many of the tumor suppressors can result in dry eyes including; Bevacizumab (Avastin™), Lapatinib (Tykerb™) and RAD 001 - Everolimus (Afinitor™). These medications can cause dry eye issues and require excessive individuals to drink more water to compensate. Dry Eye issues a result of Avastin, typically only results for the first 3 months of treatment. When taking medications that cause dry eye issues, the eye issues stop when medication is discontinued. Soothing Irritated Eyes: Damp Warm Washcloth can also help eyes that are overly dry. Night Care: Use of thicker eye drops or gel than used during the day and Tape Eye Closed at night. Certain medical tape can be better than others, talk to your doctor. Humid Conditions: Use a humidifier to moisten the air, or leave plants in your home to help raise humidity levels all year long. Use of goggles in extreme dry situations. Wear glasses or sunglasses to reduce wind to eyes. Eye Weights: Eye weights can help the eye be not as wide open to help protect it and help hold moisture in. This can even out the appearance of eye to look more natural as well. Tear Plugs: Tear duct plugs can help hold in moisture. Consult your doctor who can also weld the ducts closed permanently if you benefit. Eye Mask: A regular eye mask may also help keep lid closed and or prevent excess air from entering the eye at night. REMEMBER TO BLINK! ! ! Refresh PM: This Gel can be used both during the day and at night. Refresh Lacri-Lube Eye Ointment: Helpful for night moisturizing, but is not recommended for the day. Too much leaves a film on the eye that makes it harder to see. GenTeal Gel: Can be used during the day. GenTeal Lubricating Eye Ointment: Can be used both during the day and at night. Systane Ultra Eye Drops: Can be used during the day, but would likely be needed several times a day. Eye drop bottles are typically require preservatives which when used regularly are irritating, but this is a box of single use drops and has no preservatives. Systane Gel: Can be used during the day, likely requiring only a few reapplications. Systane Nighttime Ointment: Can be used both during the day and night. 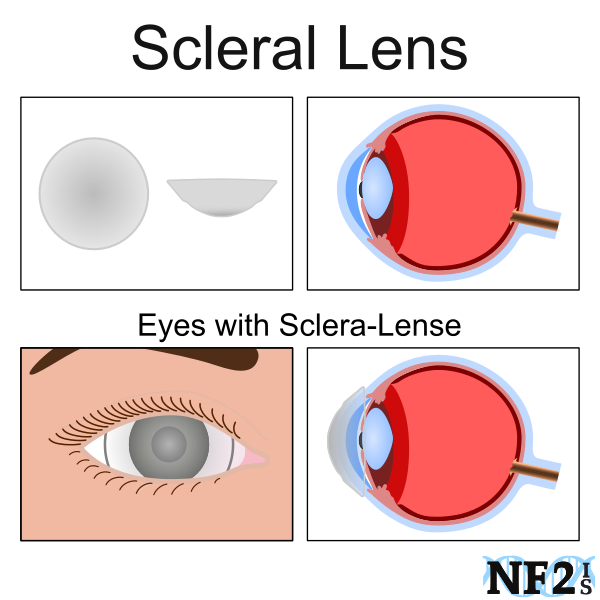 Scleral Lenses also known as Sclera Lens: A lens that site over the sclera part of the eye. A Sclera lens is similar in form in some respect to contacts used for eye correction, but are double the size and meant to protect the eye from dry eye damage that can result in permanent blindness. Use of these alone might help improve vision from eye strain or cornea scratches after a few short months alone. These lenses are available in different brands and which is ideal should be considered after reviewing all brand advantages and disadvantages. 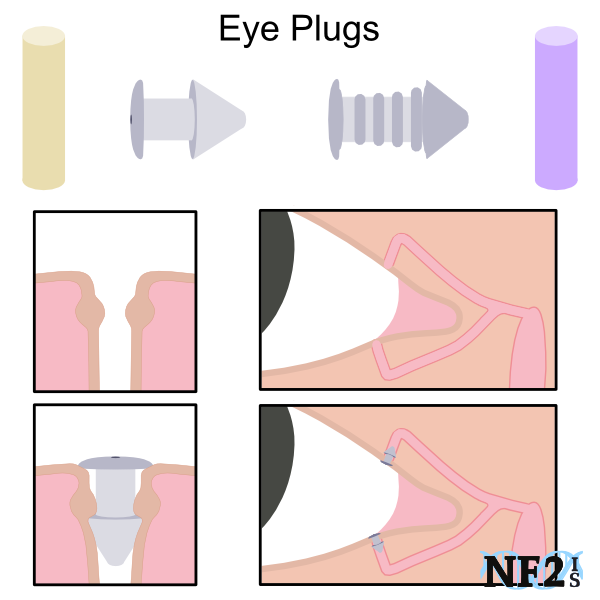 Plugging the Puncta (Tear Ducts): There are different types of eye plugs, all are temporary and might last a few days or a few weeks. 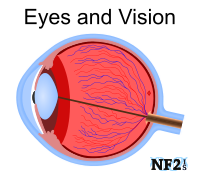 Lagophthalmos Eye Weights: There are two main forms of eye weights. External Eyelid Weights (Blinkeze™) - These come in a variety of weights and skin tones. Not recommended for night use. 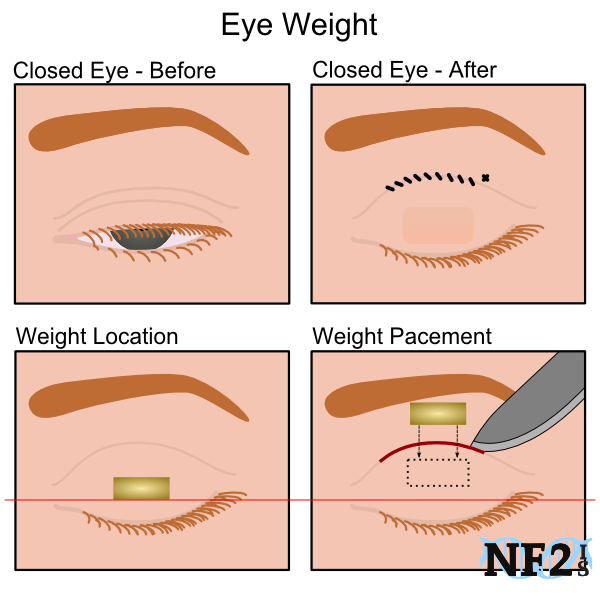 There are different forms of eyelid implant weights; some are thinner than others, while some contour to the eye better. The gold weight is the most commonly used and might eventually need to be replaced with a platinum weight if irritation develops. 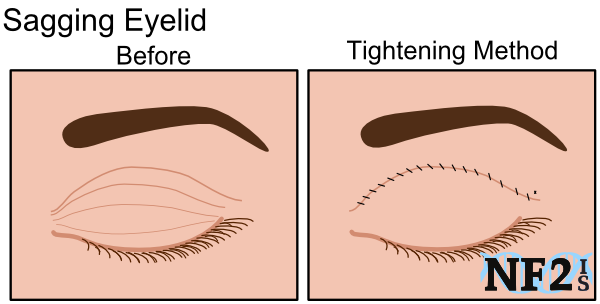 Tarsorrhaphy (Eyelid Tightening): Stitching the outer or inner corners together evenly or to shorten the upper or lower lid. This offers options of limiting eye exposure. It can help retain moisture and can also help protect the eye. This surgical option is not always a very cosmetic friendly option, but can be helpful in saving vision. 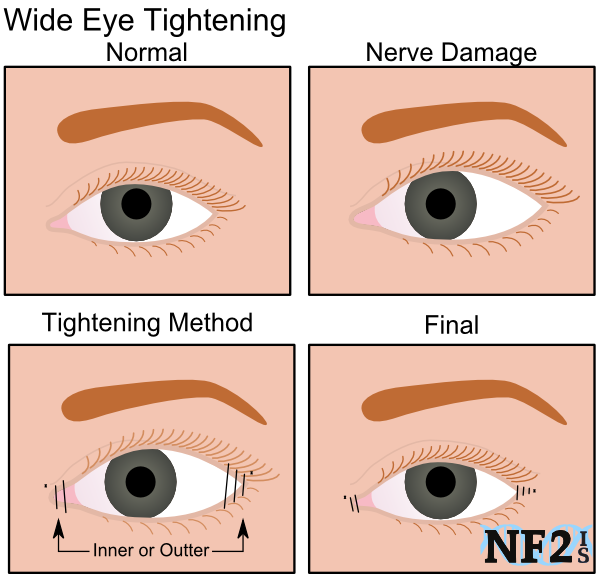 Some eye tightening techniques to look into include; Eyelid Spring, Lateral Canthal Sling, Palpebral Eyelid Spring, Lateral or Central Tarsorrhaphy, and medial lee canthoplasty. Acupuncture: Acupuncture can be used to help stimulate the nerves around the eye to help the eye heal. The sooner this is started, the better the chances are it will help.